Since Marley the Dog and Payton the granddaughter came along, poor old Sadie the dog has been hard-pressed to get posted. 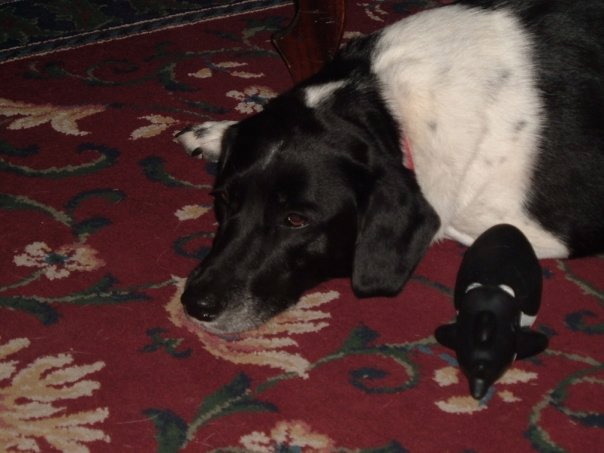 I was rummaging through some recent pictures and came across this one, from a few days ago, showing Sadie resting from playful endeavor with her favorite be-belle, a black and white whale-fish looking squeeze toy. When the toy was new, it squeaked when the Sadie squeezed it, but with her roughhouse play, that mechanism wore out a long time ago. It’s just a flimsy piece of plastic, now. Marley enjoys the toy as much as Sadie, as they occasionally use it for a game of keep-away. What really struck me in this picture is the similarity between Sadie’s and the fish’s markings. The toy looks like Sadie! I never noticed that before.